I have tried to make the data as searchable and accessible as possible. The page will only show at a maximum the top 100 results as there is just too much data and paging through it is pretty pointless. However, there are many filters you can use to narrow down the search to what you are interested in. Also, any column can be ordered by clicking the table headers. 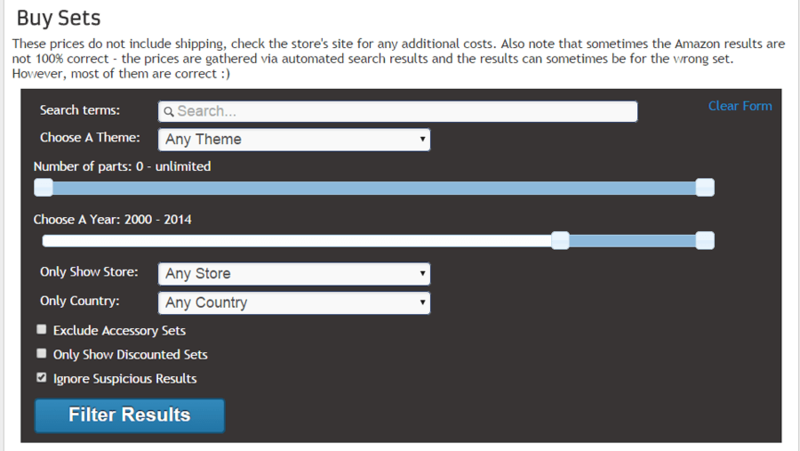 The default page will search through every set's data and display the most discounted stores/sets. By default it will show all prices in your local currency, but you can change that. While building this feature I noticed that the majority of the historical data I had saved from Amazon was a bit dodgy. Specifically - the results were including offers from third party resellers on Amazon who like to list very cheap prices and tack on high delivery fees. 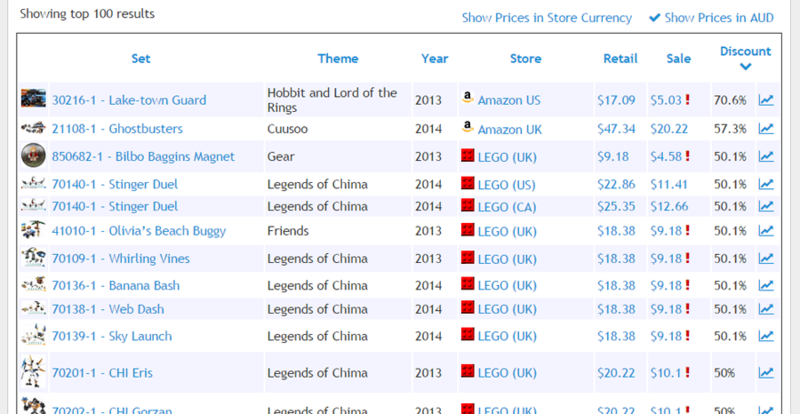 So as of 18th Oct 2014, I split the stores into Amazon Only and Amazon + Resellers to highlight the difference. Then I added the "Ignore Suspicious Results" checkbox to the filter to hide them. It basically just looks for sales from the Resellers with a discount greater than 50% and assumes they are probably not real. Also some of the Amazon results may refer to incorrect search results. For example the 21108 Ghostbusters Ecto set actually uses the 42002 Hovercraft results for some strange reason. I have not been able to find a decent dependable way of checking if the Amazon search feed results are correct. If you have experience using their Product Advertising API let me know! If you click the little chart icon you will go to a page with charts (surprise) of all the known history price data. These charts look a little busy at the moment, but you can zoom in and toggle each data series by clicking on the legend. I might continue to tweak the default view to make it easier to understand. What does everyone think of this feature, is it something you are likely to use? I have been a bit hesitant to add this for a while now, as there are other sites out there that do similar things. Also, I want to add a "Watchlist" type feature where you can put a watch on certain sets/stores and when the price drops below some defined threshold you will receive an alert. Any ideas for making that more awesome than just another source of spam? I'm not one to talk much about the site's costs or revenues. However, I want to make this one brief mention of it. Despite the fact that Rebrickable has been steadily growing in popularity and traffic, the revenue has actually been dropping. Rebrickable supports itself through a variety of methods, with the biggest component being "affiliate sales". If you aren't familiar with this it works as follows: when someone browsing Rebrickable follows a link to Amazon/eBay/LEGO shop and then buys something, Rebrickable is paid a small % commission of the sale price. There is no additional charge to the buyer. I'm actually quite impressed. Will come in very handy now that Lego sets seem to be getting very expensive from main retailers. A great help that will save a lot of browsing time. I really like the addition. Thank you for your ongoing efforts. Think about a "donate" or "premium account" to give users addt'l ways to support you! I wonder if you would maybe benefit from comparing data to the MSRP listed at Brickset (unless you want to have that same data listed here). It shows a huge discount as the original price is listed as $14.99 on Amazon, but looking at Brickset it shows it as a Toys R Us exclusive with a MSRP of $4.99. (This is also what annoys me with shopping for LEGO on Amazon and filtering by discount. I guess a big problem is the sets with no MSRP (like all of the VIP giveaways). 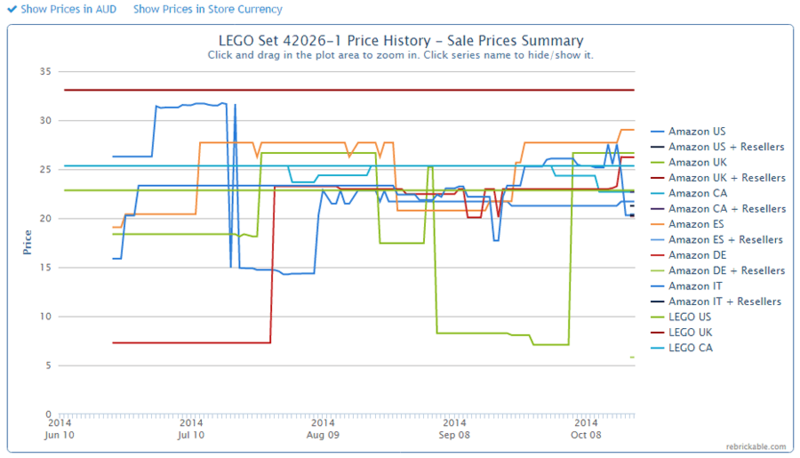 It would actually be nice to have it have data like http://brickset.com/sets/30216-1/Lake-town-Guard for used and Ebay price history, as many stores as possible, and work in all countries. For Amazon, maybe it would make sense to break it down as sold by Amazon, Fulfilled by Amazon, and then the other sellers. Also, would it be possible to have the store selection be a checklist to have it only show specific stores that we would want to check, use that for chart generating so it only shows the stores we have interest in, and have this be storable with our profiles as a default setting to make things easier for the end user? Also, what about on the chart have a subtle (dashed line?) showing the MSRP for a persons selected country for reference. The red exclamation mark next to the price indicates the data is old. The tooltip will show you how old. In this case, it's a remnant of when the "Amazon US" store included third party sellers. I might need to delete all old data to fix this properly, or just take note of that exclamation mark (I'll probably add a filter to ignore them by default). As of 18th the data is split up into Amazon and Amazon+Resellers which is all the API allows for. Would you mind creating a forum topic for your other suggestions, the comment here aren't really suited for back and forth discussions. Looks like a great feature. Curious as to why there is no way to donate if we want to. That site you use looks to have some nice features such as http://www.brickwatch.net/sites listing the number of sets that are cheapest on its site. Just one question where is the brickowl and bricklink stores? You have them on parts shouldn't they be here even if they don't give affiliates links. 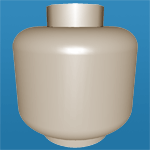 I will probably look into adding BrickOwl sets in the future if they are willing, but I doubt I will add Bricklink sets. Feature for some sort of "Premium Account"?